← Free Ian Mankin oven mitts, and apron offer…. I have been catching up on my reading with a recent article in the FT Weekend, ‘The growing culture of living furniture‘ about bioengineering of living materials like fungus, moss or yeast and bacteria cultures, so the title is a play on words, oh and there is a joke about fungi…. But the content is noteworthy. In 2012, Philip Ross, an artist and mycologist based in California teamed up with local carpenters to grow furniture from an engineered type of mushroom called linzghi and wood salvage. Ross has also used the fast-growing fungi to create building bricks, Mycotecture. The vegetative part of the fungi, mycelium, forms a fibrous, root-like network. Once dried, the mycelium can be formed into a light, water, fire and mould-resistant bricks. Like plaster or cement the fungi can be cast into any number of shapes. Designers Marjan van Aubel and James Shaw have adopted another technique that makes use of the estimated 50-80% of material waste in traditional wooden furniture manufacturing, mixing wood shavings with a bio-resin. The resulting substance can be dyed in a range of colours and finished with American Ash legs to create the Well Proven chair, which was nominated for the London Design Museum’s Designs of the Year Award 2013. Other approaches are also revisiting the way we work with traditional materials like wood or hemp. Arbofoam, made from lignin a wood extract, can be injection-moulded like plastic. Calligaris, the Italian Design house, has used a similar technique to mix polypropylene and natural fibres for the manufacture if its new stackable Skin chair. Seaweed is not a material associated with the home environment, but designer Nir Meiri has fashioned the Marine Light series by layering wet seaweed over a metal lamp-shade structure and as the seaweed dries it hugs the form of the shade and the light casts through the translucent seaweed. For scientists at University of Cambridge it is an often overlooked member of the plant world, moss, that has captured their attention as a potential source of electricity through biophotovoltaics. The Moss table, which won the People’s Choice Design awards at the 2012 Design Icons exhibition in Cambridge, uses electrons formed as a byproduct of photosynthesis to produce a small current, only enough for a digital clock at the moment, but the designers believe it offers the potential for more. 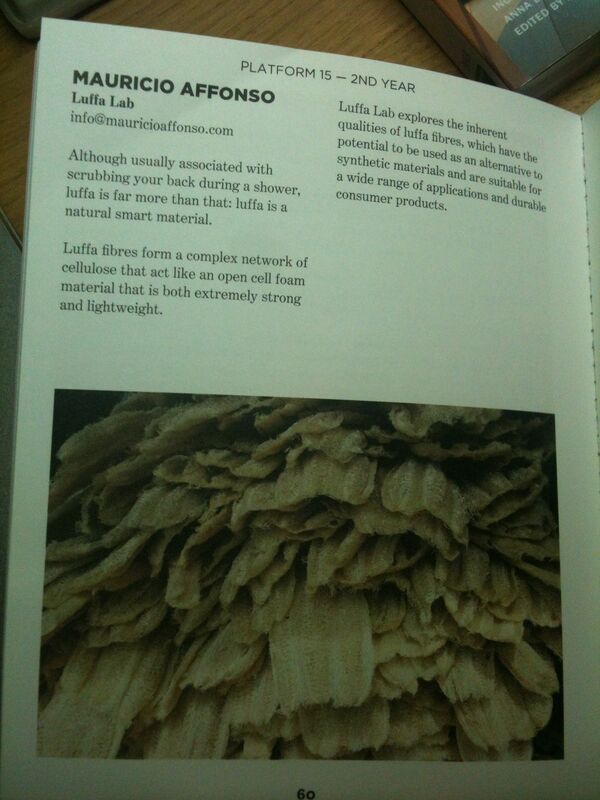 And finally, the luffa, a natural smart material. Luffa fibres form a complex cellulose network that is both light and extremely strong. RCA student, Mauricio Affonso, has been exploring the potential of luffa as an alternative to synthetic materials in consumer products, so the shape of things to come could be very different.